In Chapter 2, Alice asks herself this question after she has grown to an enormous size. 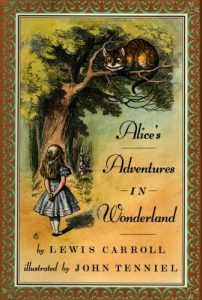 In this quotation we see how Alice is attempting to not only understand Wonderland, but also herself. As she is plunged into a world in which none of her beliefs make sense against a system of total nonsense, she feels her own sense of self begin to come unmoored. While the quotation is ostensibly a reference to her change in physical size, it also embodies the changes she undergoes as she comes to grips with a world that is wildly unfamiliar. These are the final lines of the book, and they are deceptively comforting. Spoken by Alice’s sister, this quotation attempts to idealize and minimalize Alice’s adventures. Alice in fact endured difficult, dangerous, and potentially deadly things in Wonderland. Alice is disturbed by it all. Her sister, on the other hand, tries to situate the entire thing within a childlike nostalgia. She sees the entire adventure as something Alice will one day recount with tenderness. This quotation adds a level of subversion to the story. While everything Alice encounters would subvert any sense of a fixed truth or reality, Alice’s sister attempts to subvert these experiences and replace them with the very order that Alice lost. While this quotation seems to provide a sweet and happy ending, they ultimately represent the adult world which refuses to acknowledge the reality of a child’s experience. In Chapter 2, Alice thinks out loud on how to properly speak to the mouse. She jokingly refers to her brother’s Latin book. The quotation reveals the preoccupation with language and words and the rules of language we see throughout the book. Although there are rules which guide understanding and communication, there rules simply do not apply in Wonderland. Alice has yet to fully discover this, and she still clings to images of order from the world she knows best. This comes in chapter 4 as the rabbit intends to burn the house down with Alice in it. What we see in this quotation is an underlying threat of violence which pervades the novel. Even as the book gives us a fantastic and magical children’s story, the threat of real violence crops up. What is more, when threatened with violence, Alice threatens to retaliate. She will send the cat, Dinah, after all of them and have them killed. The text is laden with threats and danger.